Künga Drölchok was born in Lo Möntang, the capital of the Mustang region of present-day Nepal. His main teacher as a youth was his uncle, the Sakya master Drungpa Chöjé Künga Chokdrup (d. 1526), who was a disciple of the great Dakchen Lodrö Gyaltsen (1444−1495). Künga Drölchok received ordination as a novice monk from Drungpa Chöjé when he was ten years old, and stayed with him constantly for the next four years, receiving many initiations and teachings of the Sakya tradition, including the Path with the Result three times. In 1519, when Künga Drölchok was thirteen years old, he traveled with his elder brother to Central Tibet and Tsang for further studies. They first went to the great monastery of Sakya and the nearby retreat center of Khau Drakzong where they received teachings from the master Künpang Doringpa (1449−1524). Then they proceeded to the Sakya monastery of Serdokchen, the monastic seat of Panchen Shakya Chokden (1428−1507), where they began the serious study of epistemology and other scholastic subjects under the guidance of Shakya Chokden’s disciple and successor, Amoghasiddhi (1463−1527). But tragedy soon stuck. A smallpox epidemic claimed the lives of nineteen of the twenty-two students, including Künga Drölchok’s elder brother. The grief-stricken Künga Drölchok went into retreat for the next eight months. During this time he memorized several basic treatises of epistemology. But then his teacher Amoghasiddhi came into the retreat and severely scolded him, warning him that sterile scholarship did not result in enlightenment, and taught him many profound techniques of meditation practice. When the smallpox epidemic had passed, Künga Drölchok emerged from retreat to again receive many teachings of the Path with the Result and other traditions from the master Künpang Doringpa, who had come to visit Serdokchen Monastery. He continued to study all the major and minor fields of knowledge for the next five years at Serdokchen and other monasteries such as Ngor and Ngamring. Künga Drölchok then returned home to Mustang, where he received full ordination and many more teachings from his old teacher Drungpa Chöjé and the ninth abbot of Ngor monastery, Lhachok Sengé (1468–1535), who was visiting from Tibet. Drungpa Chöjé installed Künga Drölchok as his successor on the throne of Pupak Monastery and passed away soon after. Then Künga Drölchok’s father also passed away. The deaths of his teacher and his father affected him deeply, and with the realization that no composite phenomena are lasting, Künga Drölchok went into seclusion and lived as a hermit. He did not wish to attend the summer retreat of the monks that year, but at the insistence of the abbot he left seclusion and gave various teachings, such as the great Sakya Pandita’s (1182−1251) Treasury of Epistemology (Tshad ma rigs gter). 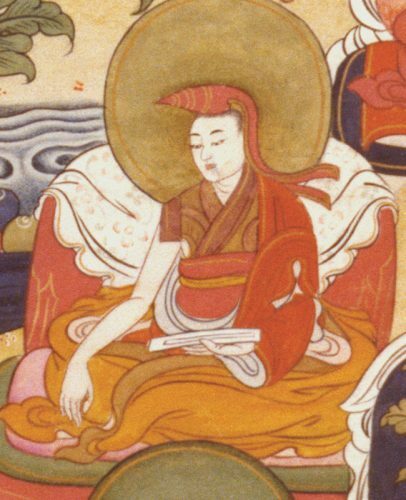 In 1528 another of Künga Drölchok’s teachers in Mustang, Panchen Jampa Lingpa (d. 1528) passed away. Künga Drölchok occupied the monastic seat at his teacher’s monastery for the next three years, which was a period of further intense study and teaching. On one occasion he went to visit the famous pilgrimage site of Muktinath in Nepal, where he spoke with and taught Dharma to the non-Buddhist Indian yogins using the Nepalese and Indian vernacular, to their great delight. In 1534, when he was twenty-seven years old, Künga Drölchok again traveled northeast into Tibet, visiting Lhasa and then the great Karma Kagyü monastery of Tsurphu where he received the complete transmission of the Kagyü teachings. He would later travel several more times back and forth between Mustang and Central Tibet. Künga Drölchok was especially devoted to the practices of the Shangpa Kagyü tradition which he received from the master Gyagom Lekpa Gyaltsen and other teachers. He met the dakini Niguma in a vision and taught the Shangpa transmission of the Six Dharmas of Niguma more than one hundred times to many masters from different traditions. He also frequently taught the Path with the Result and other precious instructions of the Sakya tradition throughout his career. Künga Drölchok was a master of the Jonang tradition’s sixfold yoga of Kalachakra which he received from Lochen Ratnabhadra (1489−1563), who seems to have been the most important of his many teachers. For about the last twenty years of his life Künga Drölchok was the twenty-fourth holder of the monastic seat at Jonang, retaining this position until his death in 1566. He was succeeded on the Jonang throne by his nephew, Künga Palsang (1513–1595). Contributed by Cyrus Stearns. Edited by Michael Sheehy from Jonang Foundation.